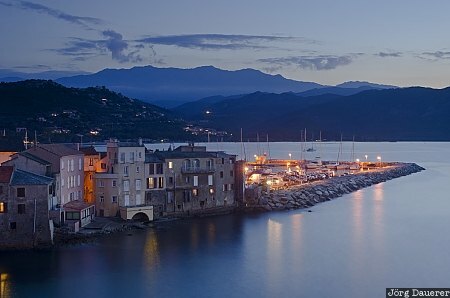 The houses of Saint-Florent, its harbor and the mountains of Corsica in the background at the blue hour after sunset. Saint Florent is in the south of Cap Corse in the north of the mediterranean island Corsica, France. This photo was taken in the evening of a sunny day in September of 2011. This photo is part of the exhibition Blue Hour (October 2016). This photo was taken with a digital camera.